The following text is about a problem on faceit. It is a third party gaming platform for Counter Strike Global Offensive. Faceit requires you to use an anti-cheat, that can snoope way deeper into your pc than the tradiotional VAC anti cheat by valve. This is a ticket i've sent to the faceit support team, burt they haven't got to me yet. I know there are alot of smart people here and perhaps someone could help me with my problem or perhaps suggest some other things i could try. I am very sorry if I posted in the wrong thread, not much of a regular here. I'm having problems playing premium. Whenever i play FaceIT with the anti cheat turned on the game will start just fine. I will play a few rounds and suddenly my PC will completely freeze. The last sound played will be repeated, making a horrific robotic screech. Pressing the caps lock key on my keyboard will reveal that the light on the keyboard doesn't change inclining that the system has frozen completely. I will have to hard power off the PC and try get back as fast as i can to my teammates. Sometimes i can play 2 games in a row and get no problems and get 2 PC freezes in the 3rd. Sometimes it happens in the first round sometimes in the 10th. Once it has happened before i joined the server. I had accepted the game, ready to connect, just getting those last headshots in deathmatch before my PC suddenly completely freezes. 10) Changed my main router ports and contacted my ISP to check for anything unorthodox. The only common denominator between these freezes i can find is that the anti-cheat is working in the background. I've also had a few times where the PC almost freezes, but it somehow recovers. The screetch appears, everything freezes, keyboard doesn't work, but only for a few seconds. I've ran out of ideas. Nothing seems to help. I'm looking for some help or a cash back since i bought the service for 3 months, but i can't play it or if i try i am potentially damaging my system. Problem persists, joined a game and first game i played pc froze. Lost another game. Freezes tend to be memory related. The fact that you are running with an unmatched pair of ram(are they both 8GB sticks?) would lead me to suspect that the ram is the culprit. One is 4GB and the other one is 8GB. At first i thought the ram was the culprit as well, so i tried running both solo. On both occasions PC froze. I ran a memtest86 overnight and it found 0 errors. I've literally tested every piece of hardware except the PSU. Could the PSU be at fault here? Wouldn't the stress tests uncover any PSU problems though? It isn't a regular freeze either. The whole pc goes to *****. The lights on the keyboard don't turn on/off when i press caps lock. If it were the PSU, I would expect crashes, Blue screens or re-boots, but not freezes. The symptoms still point to an issue in the memory subsystem. This could be anything from the memory controller in the CPU to a physical problem with the memory slots on the motherboard, or anything in between. Are you putting the ram in slots designated as being Dual Channel? Does BIOS show that dual channel memory access is enabled? I didn't find a setting in BIOS for dual channel enabling. I've since installed windows 10 and it didn't fix the issue. Perhaps cpu controller you mentioned is faulty since i've ran a heavy overclock for quite some time now. Is there any way i can troubleshoot that further? While i'm waiting on a response i will try using ram1 in slot1/2 and using ram2 in slot1/2. Another weird thing i noticed is when i'm in bios and i click on the harware tab, where it shows the installed hardware, it recognized the name of one of the ram sticks, but when i moused over the second port it showed nothing(that is the 8gb ram). Screen 1 shows that CPU-z thinks that you are running in dual channel mode for all12 GB of ram. Also, it shows that the command rate is 1T. Screen 3 shows that the 4GB stick (made by Kingston) is running timings of 9-9-9-27, at XMP1.3, single channel. I don't see how this is even working at all. You may need to go into BIOS and manually set the timings of both sticks so that they are the same (11-11-11-28 to start) set the command rate to 2T and set them both to single channel. Once you get the memory running at the same speeds, test to see if you still have the freezes. I changed 3 to 11 and one of them to 28. Saved it. Went back and noticed that my ram was linked, i set it to unlinked, went back and checked, now there was DRAM1 and DRAM2, both of them had the same timings i changed initially so i saved. I finished by changing the command rate to 2. Before changing timings i tried using only 1 stick at a time. Placed the 4gb one in the slot closer to the CPU, didn't help. Replaced the 4GB one with the 8GB one in the slot closer to the CPU and i didn't help. I agree with Clarkjd that using mis-matched memory is likely the cause of your freezes. Running Memtest doesn't prove anything, as the RAM may be 100% OK, but the integrated memory controller isn't handling the mismatched RAM. Try using just the 8GB stick of RAM in whichever slot your motherboard manual recommends for just 1 stick, AND reset the CMOS. I think by moving the RAM around and trying different configurations, your system may "think" that the mismatched RAM is still installed. Resetting the CMOS may solve this. Second screenshot shows that cpu-z thinks my only ram stick is running in dual channel mode. No, the second screen shot from CPU-Z shows the stick is a Dual RANK, meaning it has "chips" on both sides (or the architecture of the RAM is Dual Rank). 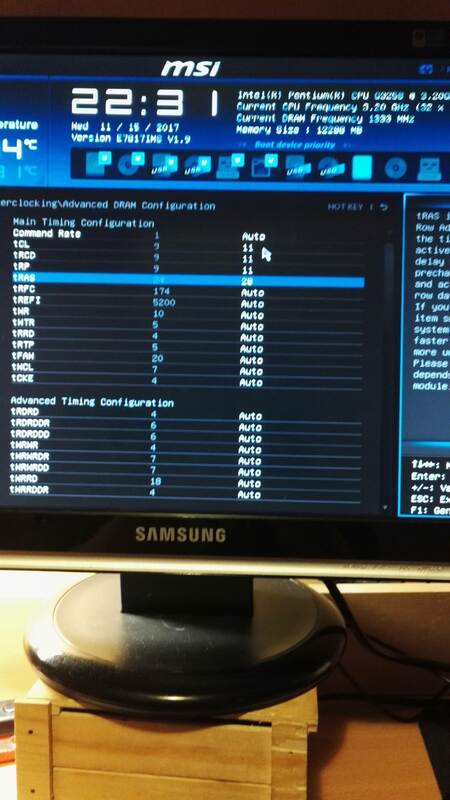 Your first CPU-Z image shows it is running in single channel mode. Hopefully the CMOS reset and using just the 8GB stick will solve your problem. It didn't. Tried changing the timings to 11-11-11-28 didn't help. Then i changed command line to 3 - didn't help. I guess i'll try all of the same with the other ram stick. I'm sensing a motherboard issue here though. When you cleared the CMOS earlier, did you do so by removing the CMOS battery? If so, was the computer unplugged from the power when you did this? If you have clear CMOS pins on the motherboard, I think the computer needs to be unplugged from the power also. Your motherboard manual will usually explain exactly how to clear CMOS. For example mine says to short out the CMOS pins "for a few seconds". Unplugged, pressed the power button a bunch of times to draw out any electricity in the system, removed the battery, went to the kitchen and had myself 4 eggs, 2 pieces of toast and some black tea. 25 minutes later, i popped it back in. Well, that certainly should have cleared the CMOS! The only reason I asked was that you said the RAM timings were not correct after clearing the CMOS. I thought maybe you hadn't really cleared it effectively. It could be a motherboard problem as you suspected, but I don't know of a way to test that except for replacing it. Are there any error logs that you could look at the time of the freezes? To possibly rule out software issues, can you boot up in Safe Mode and try to play the game. (I don't know if this would work, as maybe certain drivers for your GPU wouldn't load up in safe mode). If i don't force power off sometimes the freeze will turn in to a blue screen and it will say that something went wrong and that windows is collecting info. Doesn't really display an error message before restarting though. Perhaps i should try overvolting the ram? I'm not really in the mood of buying a new motherboard since the plan was to save up and get the new ryzen. Perhaps there is some log i can check on my computer of my last crash, that i have no idea about. Go to your search bar and type in "Event Logs". Click on "View Event Logs" and it will bring you to the Event Viewer. Do this the next time you get the freeze and note the time it happened. You can then look for an event at the time you noted. The Event Viewer is not that intuitive to me, as there are a bunch of categories you can expand. Some will take a while to populate. If you notice a fatal error at the time of the freeze, try posting the details back here, and perhaps someone with expertise can shed some light on what the error(s) mean. If this <mod edit> is caused by a power plan issue i'm going to be pissed and grateful. EDIT: Went into power settings, turned all of the hard drive and sleep settings off. Did not help. I am certainly not an expert in reading error logs, but I don't think the Kernel Power event 41 tells us anything. It is probably the result of you manually shutting off the computer when the screen freeze occurs. I don't know what to suggest next. Perhaps it could be your PSU being overloaded during the game. But when you ran stress tests on the CPU and GPU, you didn't get a freeze. Perhaps the game is stressing BOTH the CPU and GPU at the same time and it is too much for your PSU to reliably handle. The next time a freeze occurs, wait a few minutes until you force a shutdown of the computer. Note the exact time that you shut down, so you can look in the event log to see if that time corresponds to when you shut it down. You will have to use a watch or phone to note the time, since your computer screen will be frozen. Just make sure the time on your computer is the same as the time on your watch/phone, beforehand. I already comfirmed that the they match up last time it froze. When i tested the cpu and gpu, i ran each individually and then both together. GPU and CPU at 100% for 30 minutes. A typical CSGO game is 40 minutes and is not nearly as intensive as a synthetic benchmark. Also I tried taking out the gpu and running my G3258's IGPU. If i run any game fullscreen i get horrible graphical glitches and if i run windowed fullscreen then i get 30 fps. Tried uninstalling the old gpu drivers, switching monitors and changing igpu settings in the bios. This is driving me crazy, nothing works. Had another freeze while testing. Waited for the blue screen to appear. Windows gathered information and restarted. Event log shows a whole list of errors after the freeze had occured and some before. One of the errors said it had created a dump file, which i read with windows debugger and pasted it below. I looked at your dump file, but I don't have the expertise to make any sense of it. Perhaps someone else will look at it and give some guidance. I don't even know if the freezes are hardware or software related. But since you are getting lots of freezes, there is clearly something wrong. Since in your first post you said you have already reinstalled Windows twice, I would tend to think it is a hardware related issue. 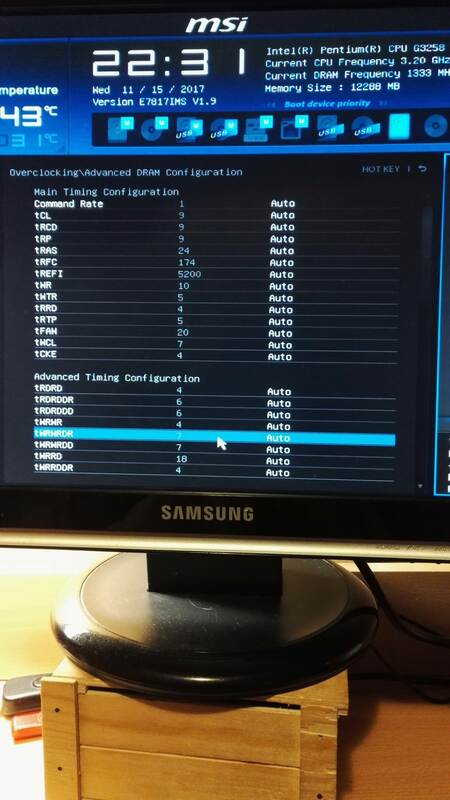 which BIOS version ais on the motherboard? Temperature of the GPU and CPU while stress testing after about 10minutes?